Batumi International Airport on Georgia’s coast has welcomed new airlines and brand new flights, offering new directions and good service to passengers. The airport - operated by TAV Georgia, a daughter company of a Turkish global brand - has welcomed El Al Israel Airlines, which performed its first flight between Tel Aviv and Batumi yesterday. Direct flights from Tel Aviv to Batumi International Airport will be performed three times a week on Monday, Thursday and Friday with Boeing-737, Boeing-757 and Airbus A-320 type aircrafts. 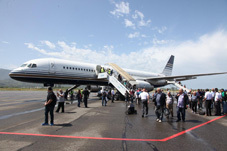 The TAV Georgia official webpage also wrote that El Al Israel Airlines would launch flights between Tbilisi International Airport and Tel-Aviv from May 31. In addition, Russia's Ural Airlines performed its debut flight from Russia’s St. Petersburg to Batumi yesterday. Direct flights from Batumi International Airport to St. Petersburg will be performed twice a week, on Friday and Monday with Airbuses A-320 and A-321 type aircraft, TAV Georgia said. The company also announced that Ural Airlines would offer a Batumi-Samara (the sixth largest city in Russia) route from June 7 this year. 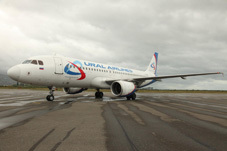 Ural Airlines started operating at Batumi International Airport last year with direct flights to Moscow. Both the Tbilisi and Batumi International Airports are operated by TAV Georgia, a daughter company of TAV Airports Holding.